To be successful in Forex trading you have to have a strategy. There is no point jumping in and out of trades on a whim. You look at the chart, and you think its going up so you go long, it then reverses on you and goes down, so you close your long position and go short. This type of trading is financial suicide in my opinion. You will never make money from Forex trading long term with a strategy like that. You have to be cool calm and collected. You have to look at the market and read what its telling you. You have to plan your trades and have a valid reason for entering and exiting those trades. Only when you do this will you begin to learn how to trade correctly. If you know why you are entering and exiting trades, you can then analyze those trades and see why they succeeded or failed. 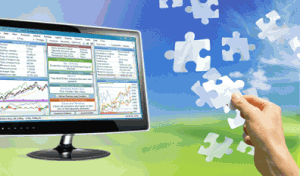 By analyzing your trades you can learn to trade correctly. There are many different strategies that you can use to trade Forex, some are good, some are not so good, and some are really good. Those are the ones i use. 🙂 I have been trading Forex for 8 years and i have tried and tested many Forex trading strategies. I currently have an arsenal of around 10 really good strategies and set ups that i look for on a daily basis. These strategies and set ups present themselves many times throughout the day, but i don’t trade them every time they present. I only trade them when the probability of them succeeding is very high. This is the key to my trading success, i use a strategy that trades on high probability set ups. I only trade when the odds are in my favor, and the chances of success are very high. I used to take 20 or 30 trades a day when i first started to trade, now i may take 3 or 4 quality trades per day. Some days i don’t take a trade at all. I have not taken a trade today for example. If the set up is there i take the trade, if the set up is not there i don’t take it. I don’t force myself to trade, i am not in any hurry to give my money back to my broker thank you very much. Trading should be an enjoyable and rewarding job. If you are stressed out and frustrated with your trading then you are not trading correctly, and your strategy may be letting you down, and you need to find another one, and quickly. However you decide to trade, and whatever strategy you are using, you have to realize the importance of it. Having a bad strategy is not going to be good for your trading, but its better than not having a strategy at all. If you can get into the habit of using a strategy then you can improve it, or change it. If you are struggling to find a strategy that works for you, please consider my Forex training and mentoring program. 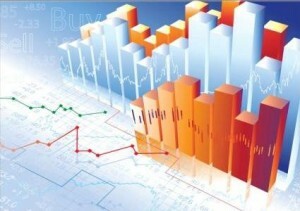 I will teach you all my great strategies and help you implement them in live market conditions one to one. Analyzing the Forex market is something that you need to be very good at in order to succeed in Forex trading. What is a trend? An uptrend is when the price is making higher highs, and higher lows. A downtrend is when the price is making lower highs and lower lows. The picture on the right is a good example of a trending market. A consolidating market, or sideways moving or ranging market, as some people call it, is exactly how its described, a market that is not trending, or a market that is moving sideways. 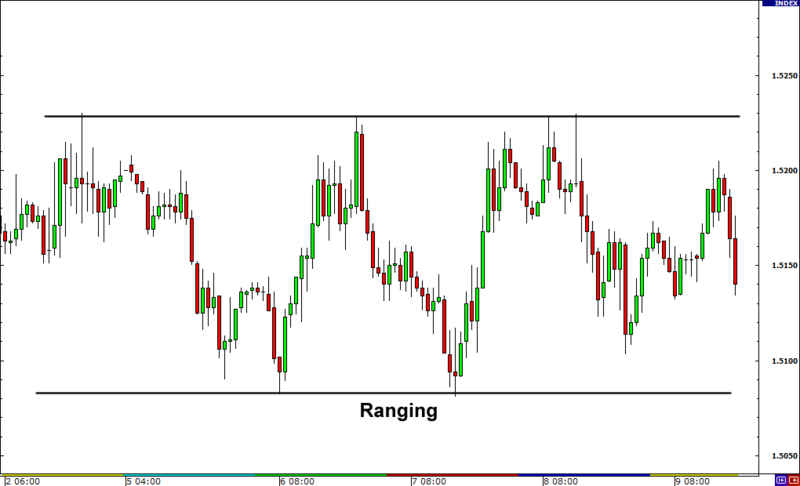 Here is a good example on the left of a consolidating, sideways moving, or ranging market. Correctly identifying what stage the market is in, is a skill that will pay dividends if you can get it right. Staying out of the market when its consolidating will save you from potential losing trades and entering the market when its trending will increase your chances of making a wining trade. 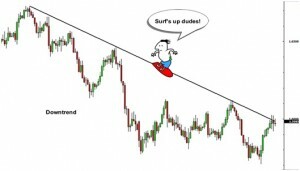 Going short in a downtrend, or long in an uptrend will often result in a wining trade. Trend trading is a method used by a great number of traders, so trading with the trend is always good advice for new traders, as you are trading with the majority of traders. If the majority of traders are selling, or buying the market will go down or up based on that principle. If you follow the trend you increase your chances of a successful trade. 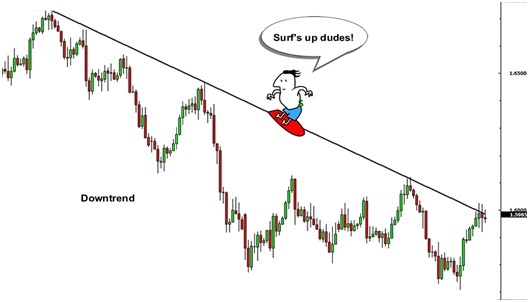 Have you ever heard the phrase “the trend is your friend” I prefer the phrase “the trend is your friend, until it ends” because if you enter a trade at the wrong point in a trend, you run the risk of the trend reversing on you, and you are now going the wrong way. The trend has now changed from a downtrend to an uptrend, and you are short in an uptrend which is not a good trade to be in for obvious reasons. Knowing when the market is going to reverse will enable you to enter at the start of a new trend, and not get caught at the end of a trend that is about to reverse. 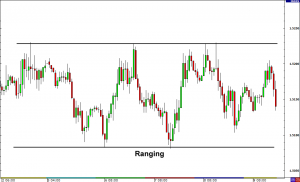 You can find more information about trend trading here.